Five years ago in 2009, Seiko had introduced its first Hi-Beat caliber in nearly 41 years. For this five year anniversary, Seiko introduced a whole new caliber to this line up. 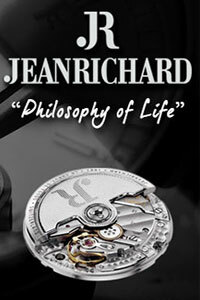 The 2009 9S85 caliber with 36,000 bph escapement was evolved upon adding a new complication, a GMT, and labeling it the 9S86. With 2 production models and 1 limited edition already released, we would like to introduce you to 3 different and very “SPECIAL” models of this new Hi-Beat GMT. 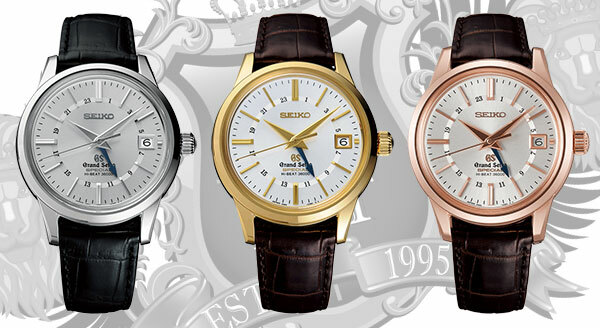 Today we bring you the Grand Seiko Hi-Beat Special GMT’s in 18k white, yellow and pink gold, SBGJ007, SBGJ008, and SBGJ010. 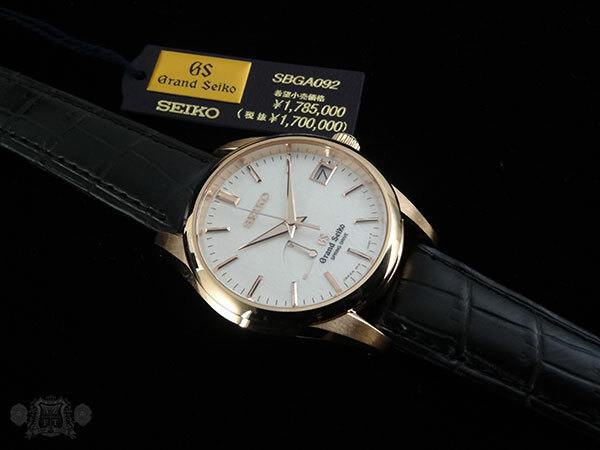 In 1968, Seiko introduce their 1st 36,000 bph caliber in Grand Seiko in the 61GS. 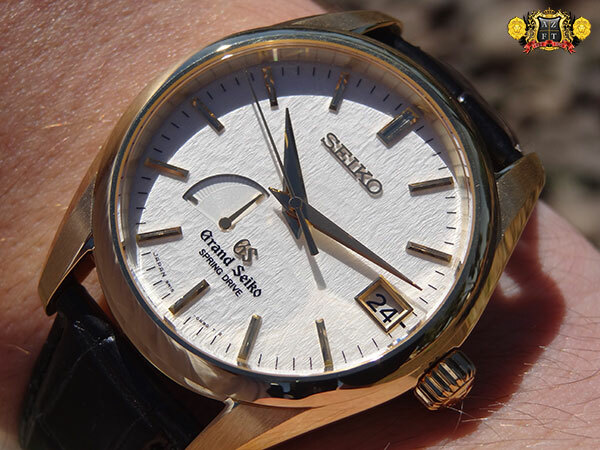 For 20 years, this rate of movement was a staple in the Grand Seiko collection. 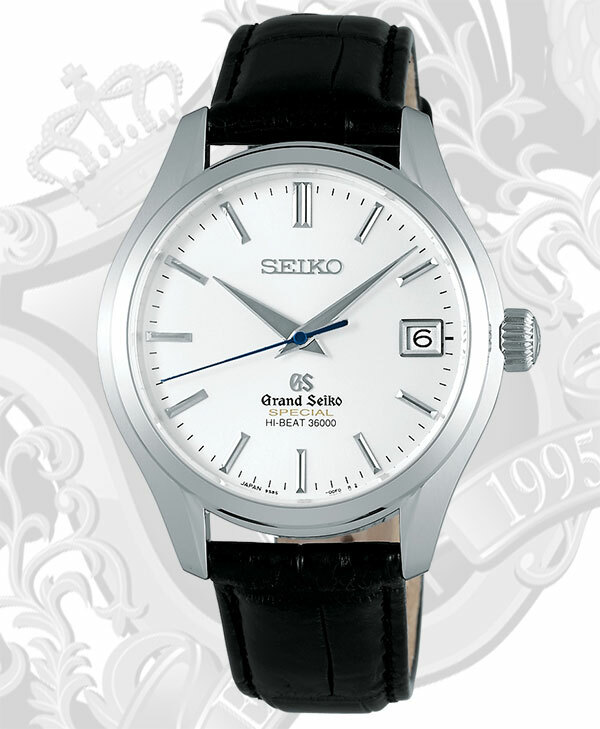 In 1988, however, the decision was made to make all Grand Seiko watches with a quartz movement. 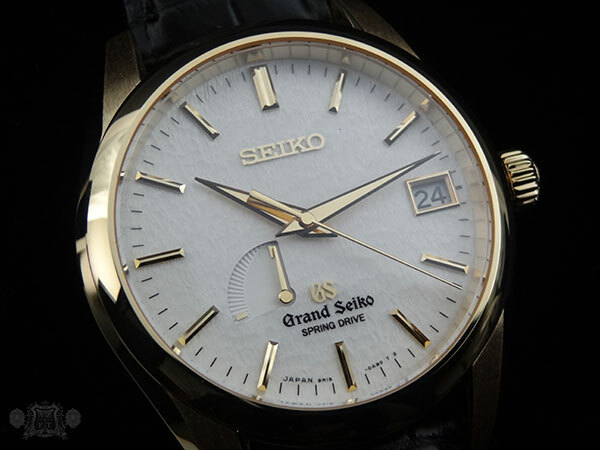 They did bring back the mechanical movements to Grand Seiko in 1998, but only in 28,800 bph. 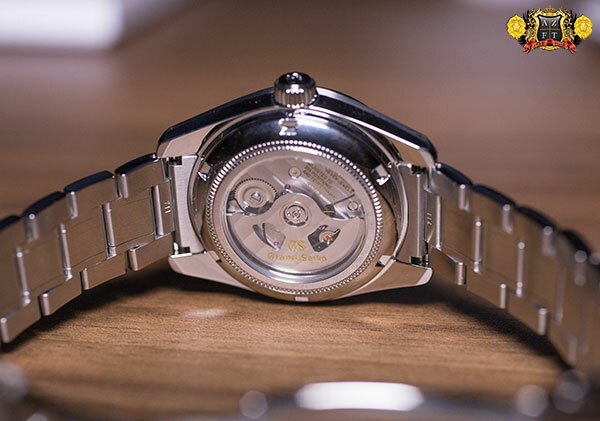 In 2009, Seiko re-introduced its 1st Hi-Beat caliber in over 21 years, the 9S85 movement. 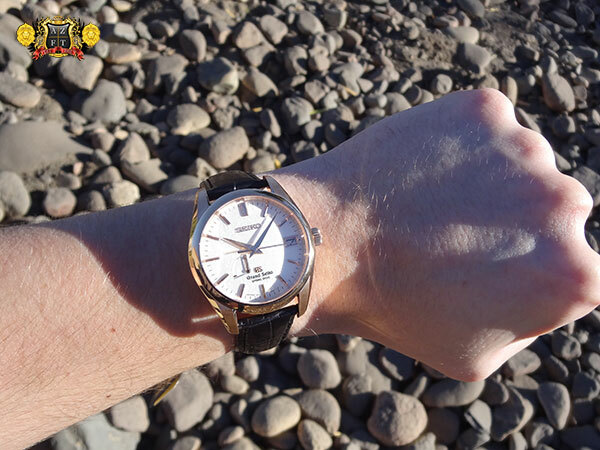 The advancements in technology allowed Seiko to tremendously improve on the resilience of the hairspring. MEMS and CAD/CAM manufacturing allowed them to build smoother, stronger, lighter and more precise escapement gears and pallet forks, and the alloys for the mainspring were able to provide enough power and torque to supply the faster rate, as well as extending power reserve. All of these factors came together to build a superior movement at a fast rate, eliminating some of the most prevalent issues of wear and tear with a 36,000 bph caliber. For the 5 year anniversary of the 9S85 caliber, Seiko has expanded the series of calibers by adding the 9S86, with new GMT feature. 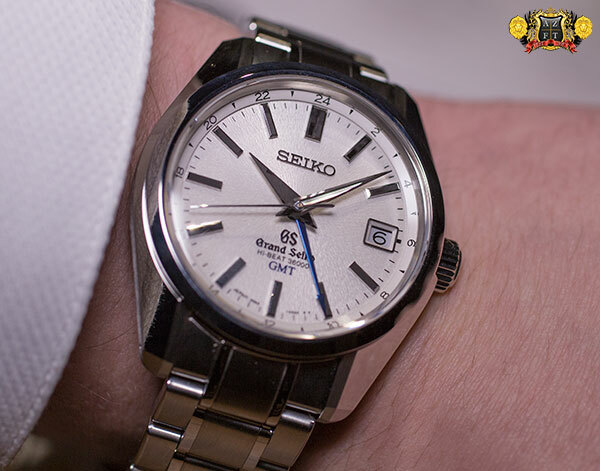 To celebrate this new release, Seiko introduced 3 new models with the new 9S86 caliber. 1st, we introduce the Limited Edition, SBGJ005. The dial of the 005 is a beautiful dark green with gold accents to symbolize the summers surrounding the Shizuku-Ishi watch studio in Morioka Japan. During the summers, the trees are a beautiful green surrounding Mt. Iwate, which is visible outside of the windows of the studio. The detailed texture in the radial finished dial express the ridges of Mt. Iwate, giving a beautiful texture as only seen once before on the SBGH005. The entire line up of new Hi-Beat GMT’s will have the same textured dial. This limited edition will be the only in the series to feature a unique titanium rotor with weighted with tungsten that covers nearly the entire movement, with openings to expose the beautifully striped and decorated caliber. The wing motif of the rotor expresses the leap to the next level of the 9S8 caliber. 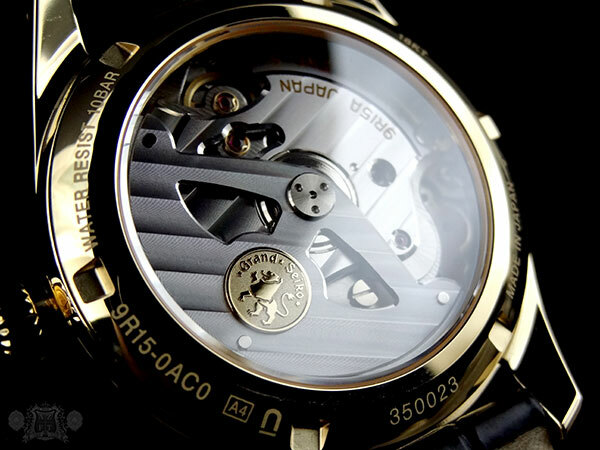 The titanium rotor is treated by anodic oxidation to create its gold tone. The titanium not only has high corrosion resistance, but also acts as a shock absorber which reduces the chance of distortion to the rotor and the its bearings. For the new SBGJ005, only 600 pieces total will be made for world wide distribution. 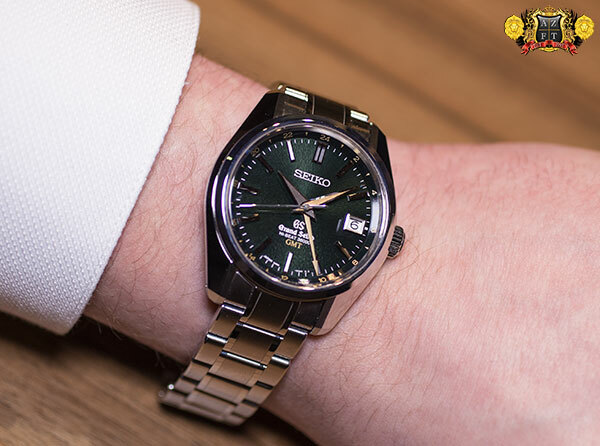 The watch expresses strength and growth (of which Grand Seiko has gone through a tremendous amount of over the last 4 years), and has a tremendous deep look to the dial. 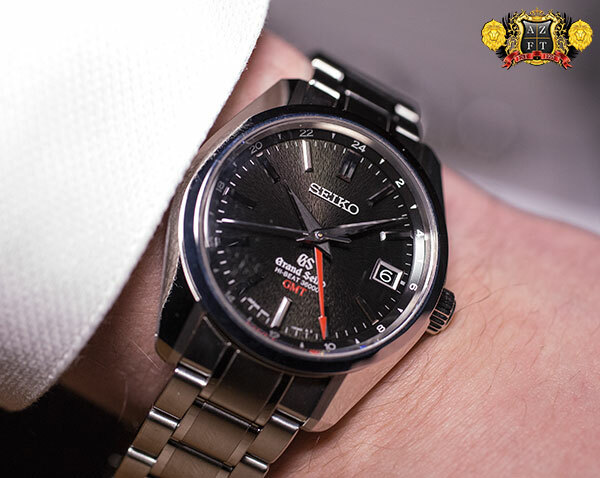 There is much meaning that goes into Grand Seiko as a brand, with the SBGJ005 expressing many great things in Grand Seiko’s history, heritage and evolution. The next piece in the new 9S86 series is the SBGJ003. This model will have the same ridge textured dial as the SBGH005 with red GMT hand and accents. The stainless steel case on all three models is 40mm, inspired by the 1st Grand Seiko to come out of Daini Seikosha (now SII/Shizuku-Ishi), the 44GS. While it is not quite the same as the SBGW047 released last year, it is more comparable to the SBGR081/083 automatics. The case on the SBGJ series will be slightly thicker then last years automatic LE, at 14mm. The finish is of the case exposes a significant amount of the Zaratsu blade polishing technique. This mirror like finish is considered to be one of the finest in the industry, and dates back to 1964 when Seiko first started using it on the Grand Seiko wrist watches. These also have a beautiful slightly domed sapphire crystal with Seiko’s proprietary anti-reflective coating, eliminating 99.9% of glare. The final piece in the new Hi-Beat GMT’s is the SBGJ001. This model will have a white dial, again textured with the ridges of Mt. Iwate, and blue steel GMT hand. The texture is easiest to see of the 3 new models, as the darker colors texture tend to fade into the shadows, making them more subtle. The GMT movement features an independently adjustable hour hand, making for quick timezone adjustments without deviating the watches -3 to +5 second per day accuracy rating. The look of the white dial with blue accents is very reminiscent of the Snowflake model, due to texture, crossed with a slight bit more silver as you would see in the SBGH001. The design on all 3 are gorgeous making for difficult decisions between the 3. Of course, the limited model will be in the most high demand for obvious reasons, but all 3 are outstanding. For core production models (SBGJ001 and 003), the rotor will be the same as on the SBGH series. Striping can be found throughout the movements, with all the same special manufacturing methods as on the original SBGH series. 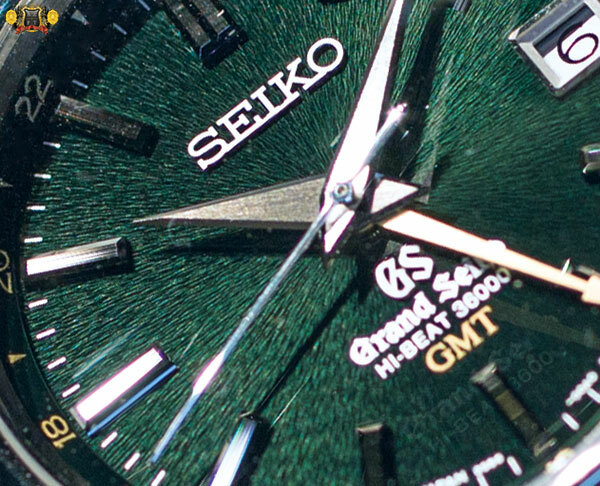 The sapphire crystal case back will also have the subtle Grand Seiko Lion hologram visible at certain angles. Another beautiful and subtle detail as always found in GS. Official pricing on the SBGJ001, 003 and 005 is still being finalized. 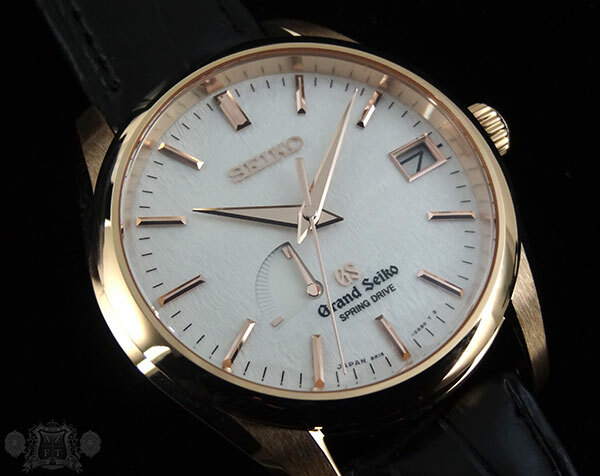 There are also a set of Grand Seiko Hi-Beat GMT Special’s coming this year in 18k White Gold (SBGJ007), Yellow Gold (SBGJ008), and Pink Gold, SBGJ010. These will feature a specially adjusted movement with higher accuracy rating then the Grand Seiko Standard (+5/-3 seconds per day). 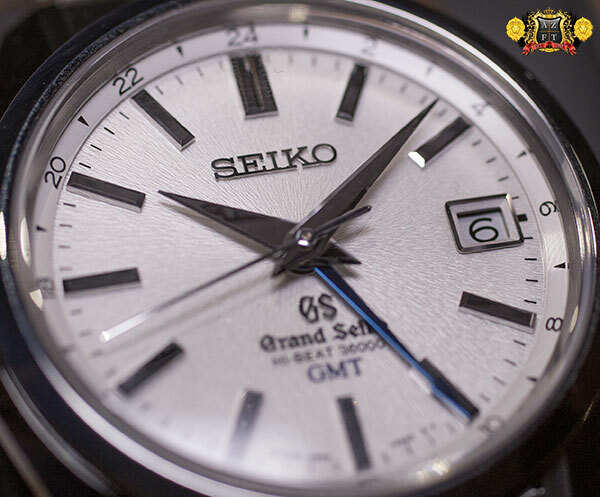 The Grand Seiko Special Standard models will have a +4/-2 second a day deviation rating, making them one of the highest accuracy mechanical movements available. The case size on these will be 39.5mm wide and 13.9mm thick. These are estimated to retail from $20,000-$21,000 and only 200 pieces will be produced between all 3 colors annually. Finally, this year will also introduce a stainless steel Hi-Beat Special (non-GMT) model labeled as SBGH035. This will also have the +4/-2 second per day deviation rating and come in a 38mm case with back crocodile strap. Only 300 pieces will be made world wide, and are estimated to retail at about $7,500. All models are currently available for pre-order. If you have any questions, please feel free to call us at 1-800-486-3996, or submit an inquiry through AZFineTime.com. 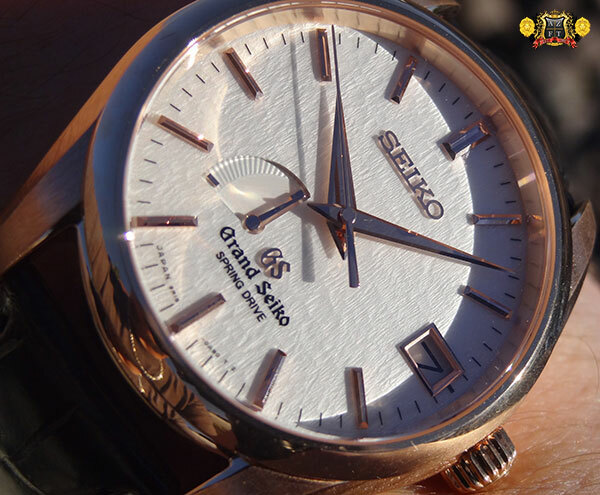 To conclude our series of reviews on the Grand Seiko Snowflake Special Editions in 18k gold, we today introduce the pink gold variation SBGA092. As there were only one of each shade (white, yellow and pink) for the US market, these highly anticipated and beautifully crafted timepieces are truly collectible and in very limited supply. The rarity of this model is something that any collector can appreciate, but the craftsmanship itself is enough to grab the attention of most avid watch connoisseur. The level of finish is something that can easily be admired with the distortion free and high sparkle thanks to the katana blade finishing technique. While its 39mm 18k pink gold case has this tremendous finish, the hands and indexes also partake in the same type of finishing, with diamond cut edges catching the smallest glimmer of light and reflecting, which adds to its legibility. Its classic and simplistic design is complimented by a clean white dial that has far more detail than one can see from a distance. The “Snowflake” dial is made to mimic the resting snow in the city of Suwa, in the Nagano prefecture of Japan, during their winter. The 6 step process of manufacturing the Snowflake dial consists of patterning by a press, cutting, applying a silver plating and thin clear coating, then applying a thick clear coating, polishing, and then printing and applying the indexes. This tribute to Suwa’s winters has sentimental value to the employees of Seiko’s Shinshu watch studio, as we learned at our 1st Grand Seiko Roadshow in 2010. Master Spring Drive watchmaker, Junya Kamijo, wore the SBGA011 titanium snowflake with great pride and was the 1st to share this beautiful watch hands on with our store. 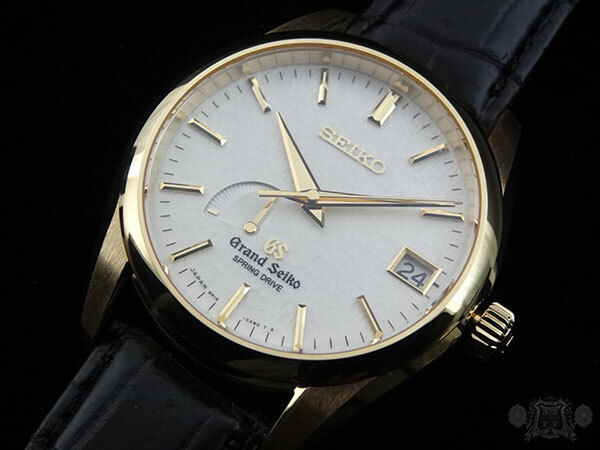 Today, the SBGA011 is one of the best selling models of Grand Seiko, and the 18k versions pay tribute to its success. 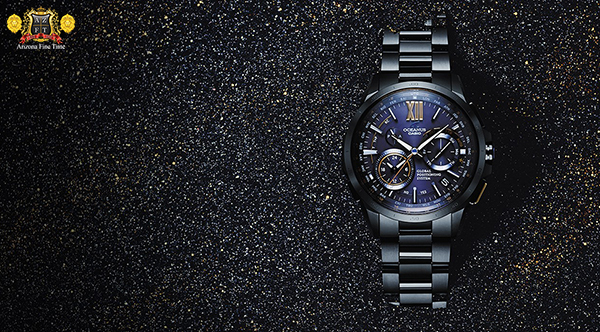 Precious metals are not the only attribute of the 18k Special Editions that make these models so unique. 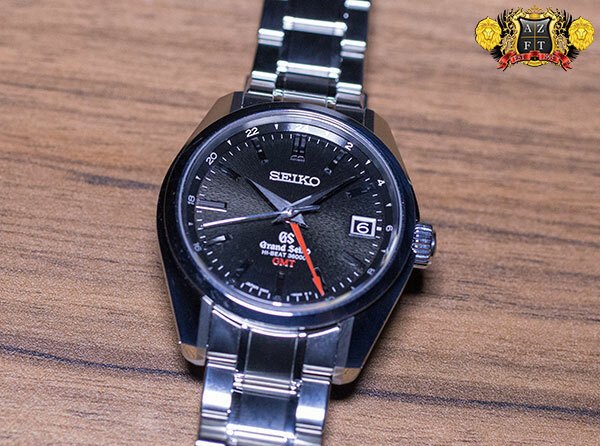 The use of Seiko’s 9R15 caliber is something very uncommon throughout the entire Grand Seiko series, as it is only used in the most special Spring Drive models. Seiko literally manufactures every part and component for this movement (as they do with all Grand Seiko’s), but one of the more unusual items they produce in house is their high-grade quartz crystals. With the 9R15, the in-house grown quartz crystal selected keeps an even higher rate of precision than your typical Spring Drive. On the 9R65 (standard GS Spring Drive movement), the accuracy rating of these are +/- 15 seconds a month (equivalent to 1 second a day), but always out performs this rating tremendously. The 9R15 succeeds the 9R65 with a monthly deviation rating of +/- 10 seconds, which makes it even more accurate than the most accurate mainspring powered watch in the world! At an MSRP of $19,000, it is not inexpensive. 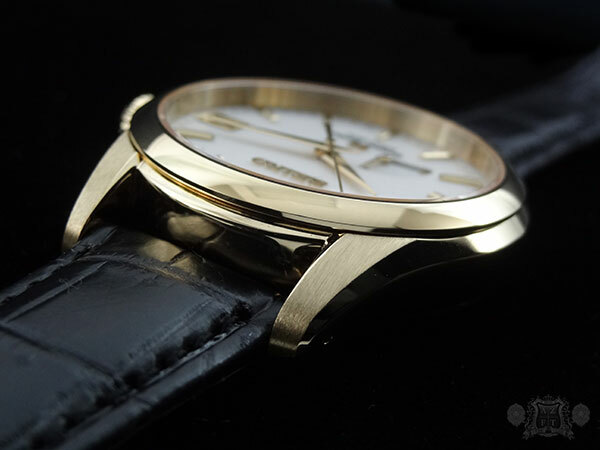 In comparison to other brands in the high-end watch world, however, it is incredibly reasonable for an 18k gold cased timepiece. It’s over the top accuracy and very limited availability make this piece well worth every penny and still proves to be an excellent value as compared to competitors. 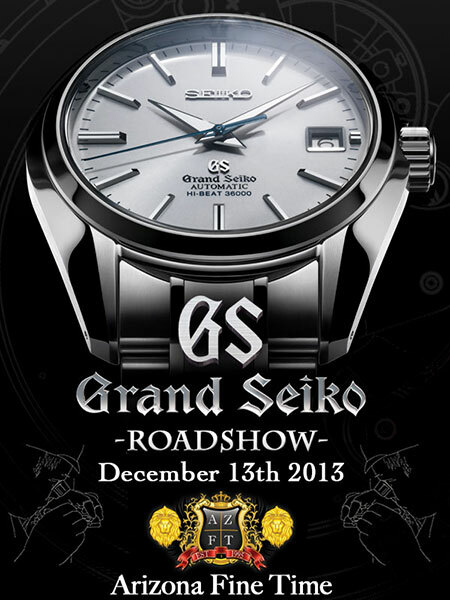 With the celebration of some of the world’s finest timepieces coming here to AZ Fine Time, we would now like to formally announce the return of the GRAND SEIKO ROADSHOW! Friday, December 13th 2013 from 3-7pm. For our second installment of reviews on the Grand Seiko 18 gold Snowflakes, we introduce the yellow gold variation, SBGA090. 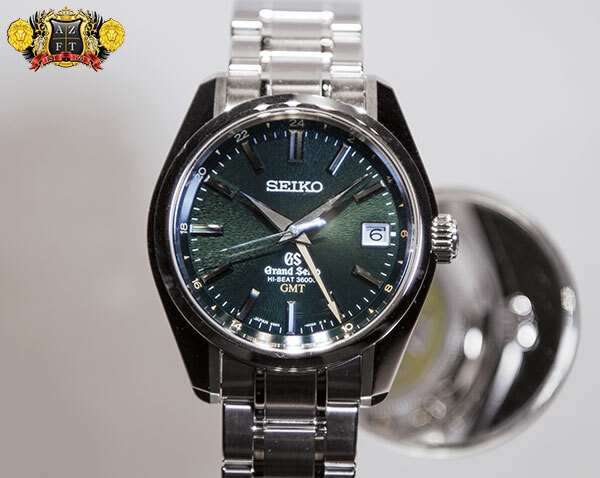 As I mentioned in yesterdays review of the white gold SBGA089, this piece is a limited production model that pays tribute to one of the best selling styles of Grand Seiko, the SBGA011. 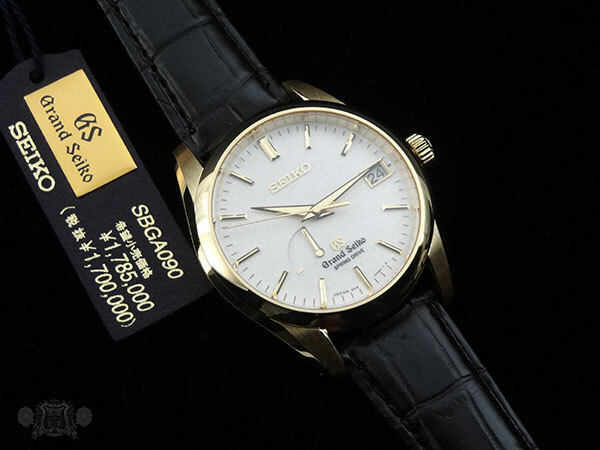 The dial for the SBGA090 is just like the dial found on SBGA011, replicating the snowfall in Suwa, where Seiko manufactures their Spring Drive movements. 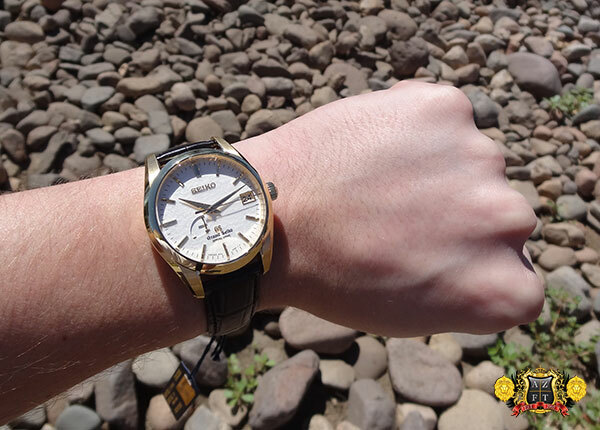 This 18k yellow gold model adds yellow gold to the hands and indexes, as well as the SEIKO and GS logo, and the 72 hour power reserve indicator. The hands and indexes are diamond cut at multiple angles, brought to razor sharp edges and finished in the Zaratsu katana blade polishing technique making light reflect at every angle. These little glimmers of light make for easy legibility in low light settings. 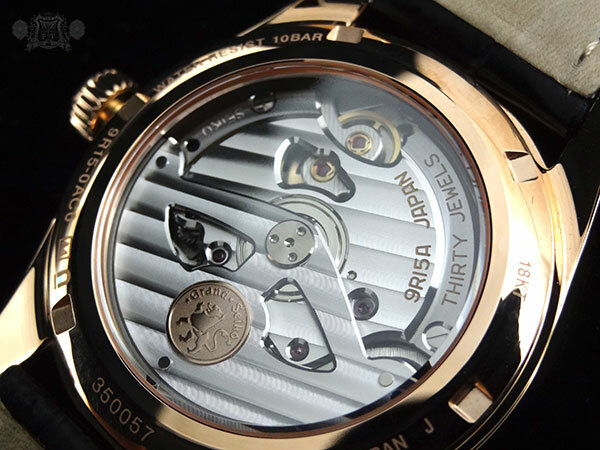 The case width is only 39mm (which is slightly smaller than the SBGA011 at 41mm). The case is also finished in the blade polishing technique, which is only entrusted in a small amount of craftsmen. This hand applied finish is done by pressing the case gently against a rotating tin plate over and over again at specific angles until the case has reached its mirror like finish. 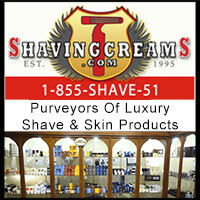 It takes tremendous experience and skill to achieve this distortion free finish. In our previous review of the white gold we discussed Yoshikazu Akahane and the near 30 years it took him to develope Seiko’s Spring Drive movement. Today, the discussion lies more in how it actually works. 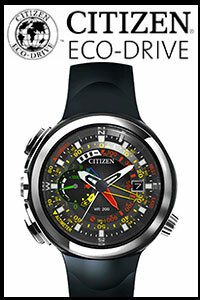 First, Spring Drive is solely powered by the mainspring, as with any other mechanical watch. 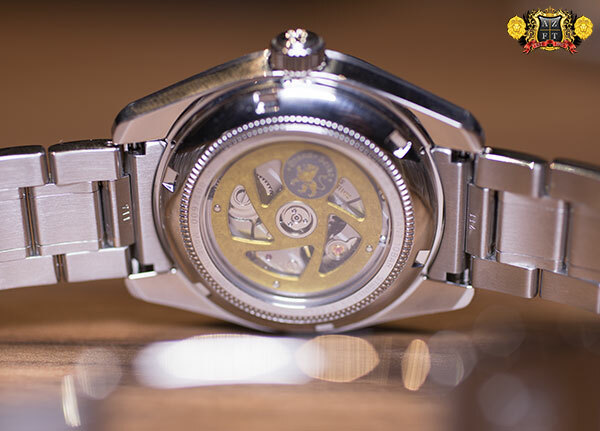 The power from the mainspring (Seiko’s proprietary alloy Spron 510), drives not only the movement of the hands, but also a very small amount is used to propel a magnetic rotor. This provides the electricity to power what Seiko calls a Tri-Synchro Regulator. The Tri-Synchro Regulator replaces the traditional escapement found in mechanical watches. 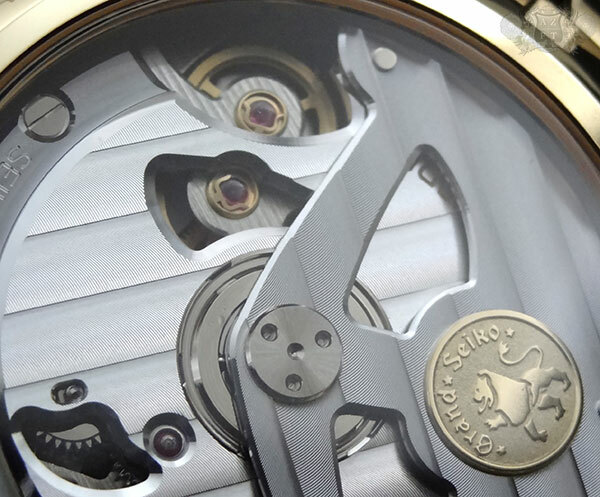 Instead of the balance wheel bouncing back and forth on a sensitive hairspring, Seiko has a glide wheel that rotates in one direction. This is what allows the unbelievably smooth gliding motion of Spring Drives second hand as well as relieving tremendous stress on the movement. The electricity from the magnetic rotor powers an integrated circuit and high quality quartz crystal. The frequency from the crystal is transferred through the IC tells an electromagnetic brake to allow the glide wheel 8 rotations per second. This is what allows for the quartz like precision in a mechanically powered watch. For the 18k Special Edition Snowflakes, the quartz crystal utilized is very unique. After extensive testing and aging, only a small amount of crystals are qualified to go into the special 9R15 movement utilized. These crystals give the 9R15 an astonishing +/- 10 second a month accuracy rating. This is symbolized in the 18k gold medallion on the rotor. 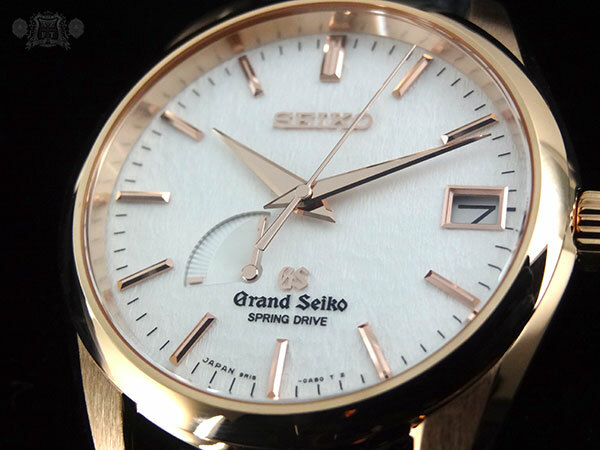 Spring Drive already has the highest accuracy rating for a spring powered watch, and apparently, only Seiko can out do themselves. Only one of each color (white, yellow and pink gold) came to the US market, and are exclusively sold at AZFT. The SBGA090 is $18,000 MSRP. 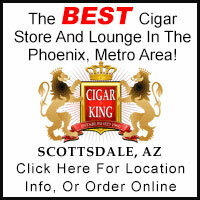 If you have any questions, please call us at 1-800-486-3996 or submit an inquiry through AZFineTime.com.